Our 4x4 feature is a set of four mini landscape photography portfolios from our subscribers, each consisting of four images related in some way. You can view previous 4x4 portfolios here. Find out more about submitting your work. Please submit your article idea / project / news / exhibition or end frame via this form. We'll then get back in touch with you to get some more details for the article. 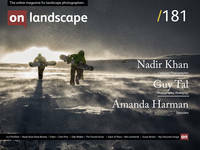 If you wish to talk in more depth about this, please give us an email on submissions@onlandscape.co.uk. You can write the idea, exhibition​ or project here or just give a quick note of what the link you submit below is about.